The Pediascan® Model 200, with the 40% light increase option and the dual redundant system, is best suited for inter-department use with large or tiny neonates. The Pediascan® Model 200 transilluminator features a high-intensity push-button switch to offer 40% light increase to provide excellent tissue/vein contrast for the nurses when starting I.V. sites or for other transillumination procedures. The dual redundant system allows healthcare professionals to confidently begin a procedure without the worries of a lamp going out. Simply, switch the lightpipe into the other port, turn on the respective lamp, and finish the procedure. All external and internal components are mil-spec or other high quality grade to ensure the unit’s longevity. The brilliant white light output is specially peaked for the best contrast with the human eye. Dual redundant argon-filled incandescent lamp for brilliant white light. 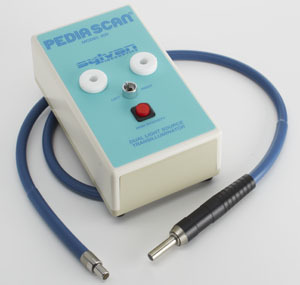 Each new Pediascan® Model 200 purchased include a K913 Battery Charger, a P101 Fiberoptic Lightpipe, and an Owners’ Manual / Service Manual. Request a quotation for the Pediascan® Model 200 neonatal transilluminator or contact us for more details.